Fruit Vegetable Rinse Sunrider is derived from cornstarch and coconut oil. The formula is edible and biodegradable. It thoroughly cleans everything from delicate broccoli heads and herbs to waxy coatings and residues. Be sure to watch the videos at the bottom of my blog post. 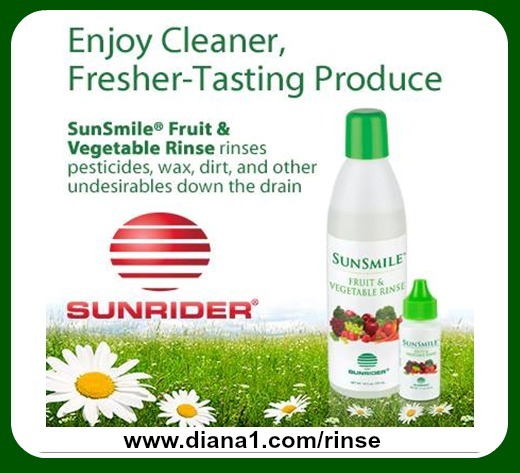 Fruit Vegetable Rinse Sunrider Sunsmile is the smart way to enhance the freshness of your favorite foods while protecting your family. Cleans fruit & vegetables of pesticides, herbicides, fungicides, dirt and waxy glazes. We all love our fruit and vegetables and they are an important part of our daily diet by providing us with vitamins, minerals and antioxidants. Unfortunately, in the growing of our fruits and vegetables, herbicides and pesticides are used. In addition, there are various germs and parasites that exist on these fruits and vegetables that we are unable to wash away. 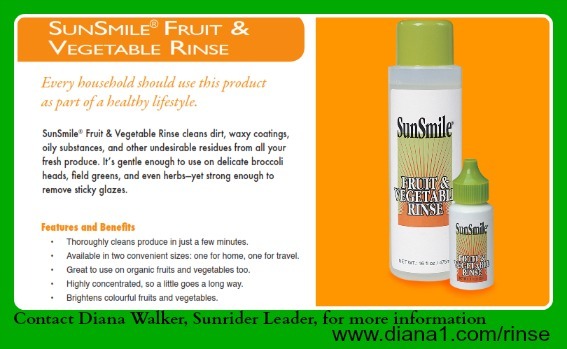 There really is no product equal to SunSmile Fruit Vegetable Rinse Sunrider. It is derived from natural ingredients that will literally destroy all harmful organisms on fruits or vegetables and neutralise each of the carcinogenic sprays (herbicides and pesticides). It can even penetrate the wax (and remove most of it) to destroy any pesticides or germs that existed prior to the wax application. This includes organisms that cause intestinal worms and amoebic dysentery. The primary cleansing agent in SunSmile Fruit & Vegetable Rinse is decyl polyglucose, a biodegradable surfactant derived from corn starch and coconut oil. The vegetable rinse is highly concentrated, non-toxic and powerful enough to destroy harmful organisms, yet safe enough to swallow without harmful effects. It is also environmentally friendly for those who have septic tanks; it will not destroy the bacterial required for decomposition of the waste. 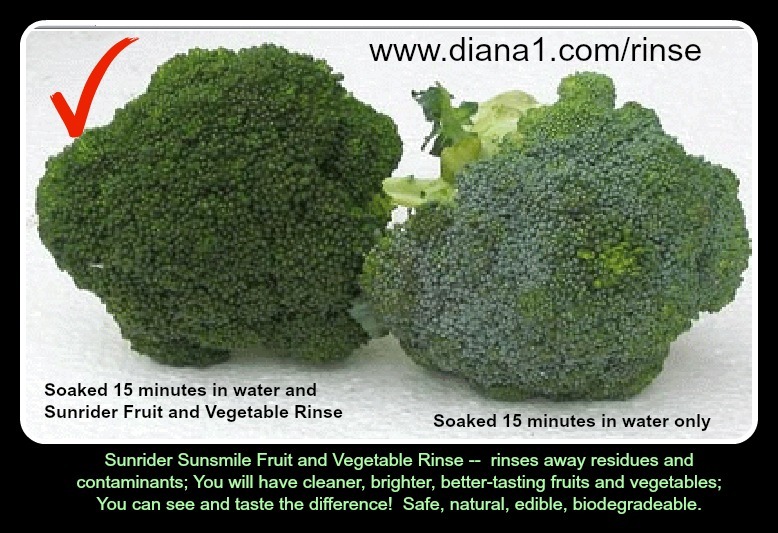 When fruit or vegetables are rinsed or soaked in this solution, then removed, not only will it clean the produce of herbicides, pesticides, oily contaminants and other harmful substances, but Fruit and Vegetable Rinse Sunrider Sunsmile will help the produce stay fresher for a longer period of time because oxidation has been reduced. One capful in 4 litres of water stays active for about one hour. • Mix 1 capful Fruit and Vegetable Rinse in 1 gallon of tap water. • Note that Fruit and Vegetable Rinse retains effectiveness for up to one hour after mixing. Any cuts, scrapes or burns can be sterilised immediately and thoroughly with this solution. Can be applied full strength or diluted. 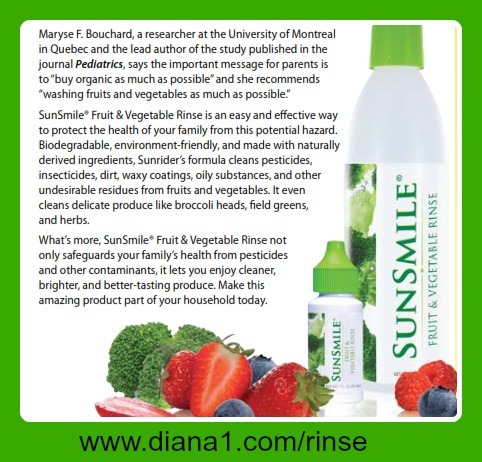 SunSmile Fruit and Vegetable Rinse can also be used to sterilise against strep, staph, ecoli, etc. on surfaces in the kitchen where food is prepared or in the bathroom where microorganisms could be a problem – even add a few drops in the toilet tank. • Add to your dish washing liquid or laundry detergent for an effective disinfectant. • Mix with shampoo to kill head lice. 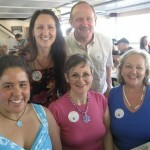 • A must for travelling out of the country where clean water is an issue. • A few drops in your pet’s food will eliminate worms during flea season. • Spritz on plants where bugs or snails are a problem – great for roses. • Nothing could clean children’s hands more thoroughly than soaking them in this solution for a few minutes. 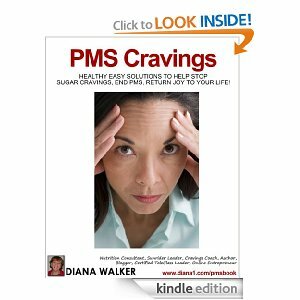 • To counteract candida overgrowth and parasites, try 1/2 – 1 teaspoon per day in a glass of water for a couple of weeks. • For those in the insecticide and pesticide spraying industry, it can be used to wash any exposed skin surface and masks could be soaked in this solution so no harmful solutions can penetrate through the mask. All articles are the opinion of the author and do not necessarily reflect the opinions of the Sunrider Corporation. This information is for nutritional purposes only. It is not the intent to diagnose, prescribe, or imply treatment. If you have a medical condition, consult a physician.